WIN a Kubota RTV – FREE! 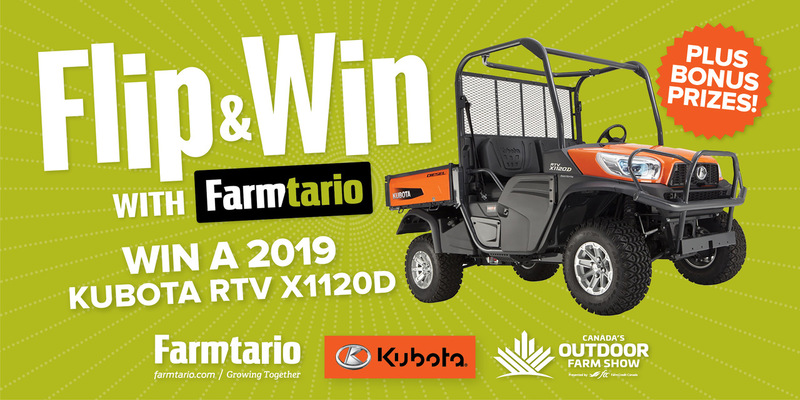 Farmtario, along with Canada’s Outdoor Farm Show and Kubota are giving you the chance to win a Kubota X1120D RTV (valued at $19,000). The Grand Prize draw will be held at Canada’s Outdoor Farm Show on September 12, 2019. Best of all, when you sign up for the Farmtario e-newsletter – Ontario’s new source of farm news and insights – you’re automatically entered to win. ** By providing your e-mail address, you confirm that you are providing consent to Glacier FarmMedia LP, on its own behalf and on behalf of its affiliates, and carrying on business through its divisions, to receive emails containing news, updates and promotions, including third party promotions, as well as product and/or service information, including that of third parties, that may be of interest to you, and that you understand you may unsubscribe at any time. Please see contact us for more information. I prefer my name and address not be made available to others. For more information on the grand prize of a Kubota RTV X1120D, click here to visit Kubota’s website.